I was thinking of what books I wanted to read in 2016, and not gunna lie… I got a bit overwhelmed. There are SO many (seriously, hundreds) of books on my list of ‘books to read before I die’ and my list keeps getting longer and longer every month! I decided that I needed to make a fun way to choose a good variety of books to read this next year, and thus the 2016 Book Bingo was born! Won’t you join me in playing book bingo this year?!? If you don’t have much time to read (you know, people with actual lives and families and legit hobbies and things), then you can try to go for a traditional BINGO (a full line across, up and down, or diagonal). If you’re a book-o-holic like me and are up for the challenge, then try go to for a full blackout on the BINGO card! I’ll be trying to fill up my entire BINGO card during 2016 (that’s about 1 book ever 2 weeks- totally doable! ), and I’ll be sharing my book choices as I go. Happy reading and happy (almost) new year! 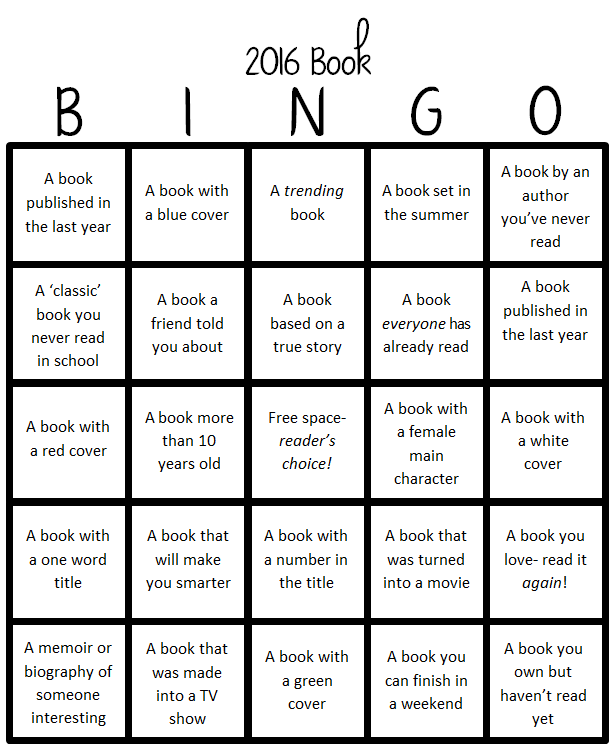 Book Bingo seems like very interesting idea. Maybe I should give it a try? Ha u have inspired me lol I am not a big reader but my New Years resolution is to read one book a month! Already finished one! PS. I tried to tweet to share your post but it doesn’t link your twitter account to the tweet – I had to add your twitter handle manually. You should check that out so you don’t miss out.